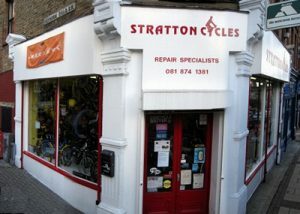 Mark and his team look after all my bikes (3 at last count). I ride about 200 miles a week so they need regular love & attention. The service is first rate, the result great, and the prices always reasonable. We’re located in Wandsworth on the East Hill road, and can be found at the address below. you can also call us on 0208 874 1381 or contact us. Wandsworth Town Rail station is the closest train station, only a short walk away. Like the cycling directions, come over Wandsworth or Putney Bridge, or come via Clapham Junction, or Putney, or Trinity road. Please note that the parking nearby is often resident’s Parking and the parking just outside the shop on Herndon Road is limited/restricted. Herndon Road is also one way and no access from the East Hill.